Twittery seem to think I have too many journals but I don't think I am there yet. I will be sure to let you know when that happens but I can assure you that it won't be anytime soon. I have been collecting journals for as long as I can remember. I just enjoy writing down random things. I think it started back in grade 3 when we were told to to bring notebooks to camp, to jot down our experiences. I didn't choose the journal life, the journal life chose me. A few years down the line and I am an avid journal collector, as stated in my Twitter bio. Which you would know if you followed me. You would also get regular updates on how my day is going and what I am doing. Which you are obviously interested in. 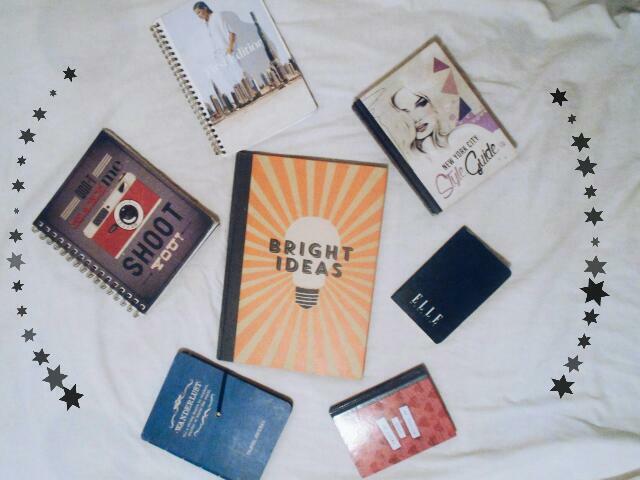 My bright ideas notebook is filled with my many bright ideas. Okay, not really. I use it to organise my life. Well, I try to do so. I write down when my school projects are due, when I'm writing which test and I plan my blog posts. I always seem to think better on paper. I always start by writing everything and then I proceed to type it. I got my Elle Magazine journal for free with an issue of, wait for it...Elle. I jot down new words that I learn and their meanings. Words are intriguing, there's a word for almost everything and when you know a lot big you sound rather intelligent. Don't make me shoot you. It's funny because there's a camera and it says 'shoot you'. That's the main reason I bought it. I love note books from Typo, actually I love all the stationery from Typo. Every time I go there it feels like I died and went to heaven. They have the coolest items and the best quotes on their products. My little book of notes is my little book of notes. I take it wherever I go and write down little notes. I was looking at some cool furniture at Mr Price Home and before I knew it I was paying for this little notebook. Yes, I do sometimes accidently buy notebooks on purpose. My New York City Style Guide is most definitely not used as a style guide. It's filled with beautiful pieces of writing. I have lots of quotes on my tablet but I will never know when it might break (which is why you should backup your pictures) or may just accidentally delete half of your pictures just like I did a couple of days ago. Don't ask how, just hold my hand as I cry. I DIYed my 'First Addition' notebook because I didn't like the cover. You are probably wondering why I bought it if I didn't like it so let me elaborate. The notebook came in set with another notebook, a pencil case, two pens and a ruler. The set was really cheap and I wouldn't leave it because of one little thing. I cut out some pictures out of magazines and bam a new cover. Last but not least is my latest journal which is still empty to this day. I really hope I can fill it with some wonderful memories when I travel the world as a travel writer. Big dreams. If you can dream it, you can do it. Wise words by the one and only, Walt Disney.